Deep in the jungles of South America dwells a serpent goddess by the name of Sachamama. A two-headed serpent, she said to have ears and to dwell upon and within the Earth, remaining still on the jungle floor for long periods of time–so much so, that passersby might mistake her for a fallen ancient tree. One folktale tells of Sachamama only moving every few hundred years, downing trees and large areas of jungle in her path as she undulates. This myth also says she has the power to put people to sleep in order to devour them! The name Sachamama means “spirit mother of the jungle” (Quechua) or “mother tree”. 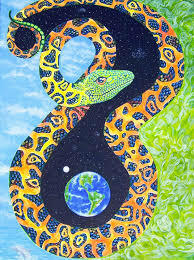 Sachamama has a serpentine sister, Yacumama—a giant sea serpent that is said to be a guardian of the Amazon river. These two sisters have the ability to operate within all three worlds—the heavens (hanaqpacha), the middle world (kaypacha, our current earth reality), and ukhupacha (the inner world, “underworld”, or subconscious). 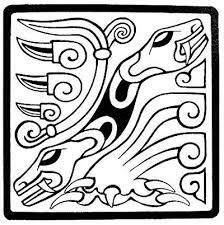 A third serpent goddess, Wayramama is the mother of the air. These legends also talk about how when Sachamama reaches the Hanaqpacha, she turns into the k’uychi (a rainbow serpent). Sachamama can send this rainbow from her mouth to direct the elements. She is a frequent archetypal energy that appears in South American ceremonies, particularly with the master plants Ayahuasca, Tobacco, and (less commonly) Huachuma. We call upon her now during this time of fire, and we invite you to listen to her with ussss. 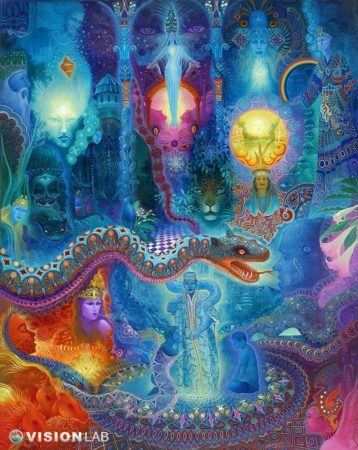 In Shamanic traditions every living thing holds a special, sacred space in the fabric of creation, and the Elements are master guardians of the Earth realm and deserve our respect. They can be communicated with, petitioned, and invoked. When we speak to the elements, we are speaking to those pieces within all of life–the atoms that make up the cells of every living thing, including us humans, are made of the building blocks of each element. With the recent fires in California, much devastation has occurred and the journey has just begun for those who were directly affected. As with any element, there is balance and imbalance. These wildfires represent an extreme imbalance, calling for a clear look at exactly how we are collectively contributing to this planet’s environment as humans. What’s also true is the way communities from far and wide keep coming together to offer support to those who are challenged by these times. We can call upon Sachamama as a guide to understanding and working with the element of Fire. 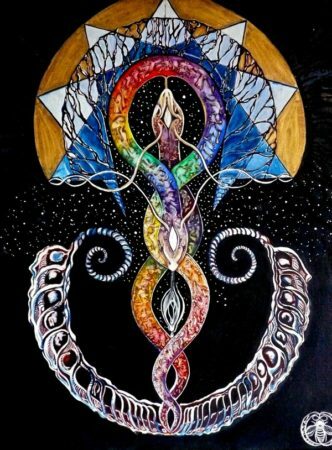 For she knows of Fire’s transformational power, and can advise us how to live in right relationship with it–including the sacred balance with her sisters Yacumana and Wayramama, Elements of Water and Air. May we honor these elements in balance and harmony, and remember Sachamama moves every hundred years to shake the earth, level the forest, and remind us to honor her.